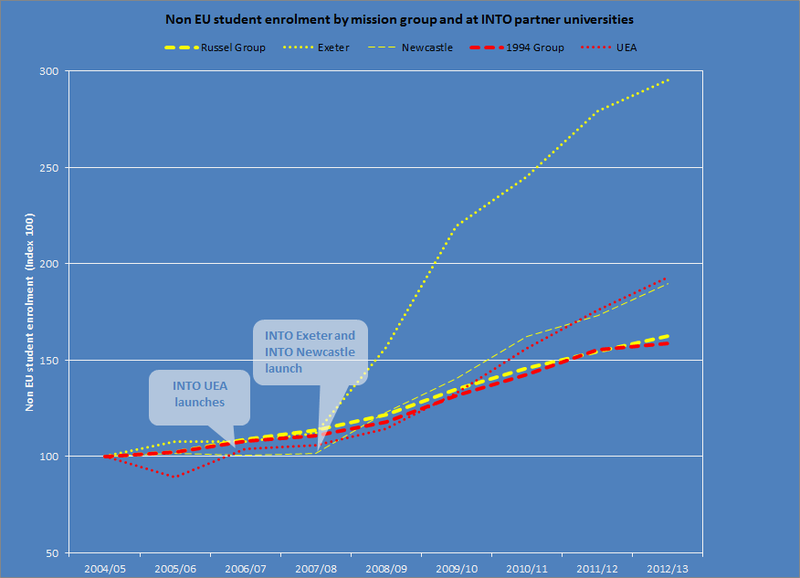 By using the Higher Education Statistics Agency (HESA) data on our longest-standing partners (University of East Anglia, The University of Exeter and Newcastle University), we have benchmarked their international (non-EU) enrolment performance against their respective mission groups. In order to allow comparisons to be made within the period 2004-05/2012-13, we have used the academic year 2004-05 as a basis upon which to build an index. The indices tell a different story about non-EU enrolment performance. 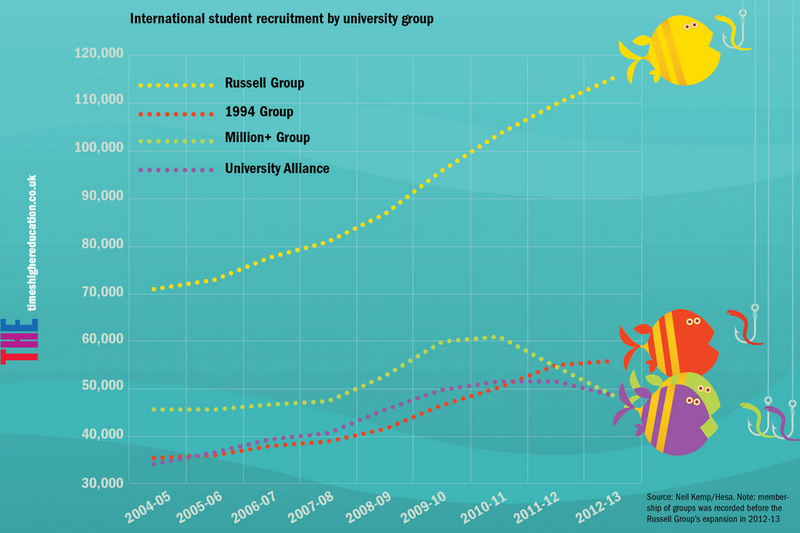 While in absolute terms, the Russell Group distances itself from the other mission groups, its non-EU enrolment growth between 2004 and 2012 shows a very similar trajectory to the 1994 Group (Annual Growth rates of 6.2% vs 6.0%). There does appear to be a common theme in terms of partnership and longer term international performance. The launch of a partnership with INTO clearly marked an inflection point for our longest-standing partners. While our partners’ non-EU enrolment trends roughly match the pace of their respective mission groups before 2007-08, the post-INTO years are characterised by an accelerated growth for them. This is hardly surprising. 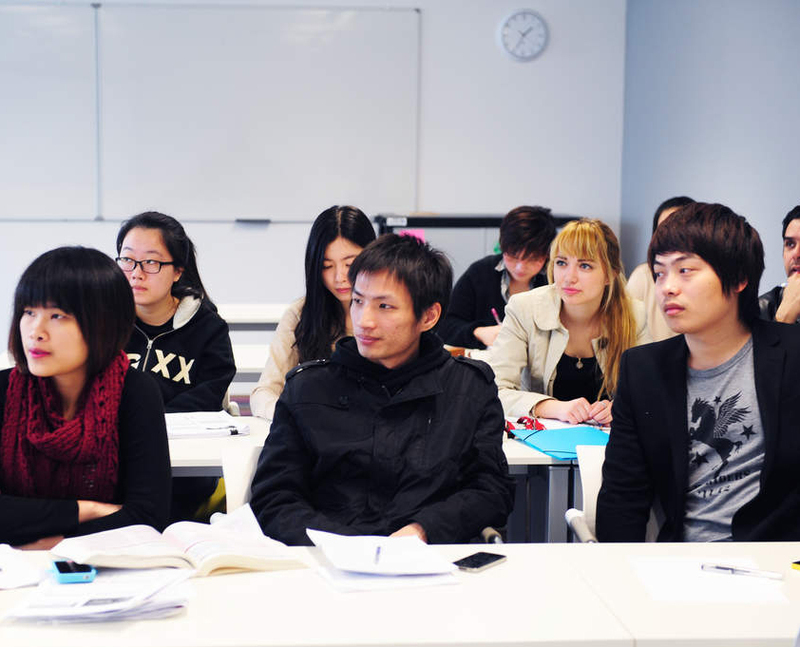 Long-term, deeply-embedded partnerships have supported the university through extending their global reach, the design of bridging programmes, investment in truly world-class facilities and a commitment to the delivery of remarkable student experiences to students who would not otherwise have had the opportunity to study at these great institutions. In the nine years observed, our longest-standing partners have outperformed their mission groups – non-EU enrolment figures having nearly doubled at Newcastle and UEA (89.8 and 92.7% overall growth respectively), and trebled at Exeter (195% overall growth). The examples presented here are too limited to draw any general conclusion about international enrolment performance and membership to a mission group. However, a few thoughts come to mind when observing the charts. The THE chart suggests that a direct correlation can be made between university groups and non-EU enrolment trends in the UK. 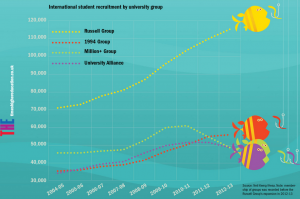 From the HESA data for UEA, Exeter and Newcastle, it appears that there is much more to international enrolment performance than merely membership of (more or less) prestigious mission groups. To find out more about how partnerships transform universities, communities and students alike, please see these detailed case studies on our corporate website.